Is there anything we can do to prevent Alzheimer�s disease or dementia? Do we have to accept that memory loss is just part of the natural progression of aging? The Memory Diet introduces a powerful, plant-based diet of leafy greens, vegetables, berries, nuts, beans, and whole grains that can slow down or even eliminate cognitive decline. The more than 150 healthy recipes�from awesome appetizers and exceptional entrees to spectacular salads and super soups�are all free of white sugar, processed ingredients, and gluten. 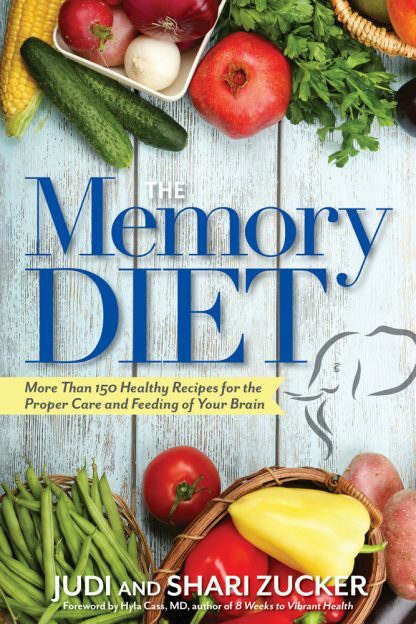 The Memory Diet�s brain-boosting recipes are based on the Mediterranean Intervention Neurodegenerative Delay (MIND) Diet, a diet plan that may reduce the risk of developing Alzheimer�s by as much as 53 percent. In addition, you will learn how to cook these foods the correct way, as many cooking methods actually cause biochemical changes in the food we eat that can negatively affect our brain health, accelerate the aging process, and cause memory decline. An easy-to-follow, seven-day meal plan. Guidelines for setting up a�mindful kitchen. An extensive resource section listing Websites and organizations that support brain health. Judi and Shari Zucker�the �Double Energy Twins��attended the University of California, Santa Barbara (UCSB) and earned BAs in ergonomics, the study of human physiology, physical education, and nutrition. They became vegetarians at age 11 and wrote their first book,�How to Survive Snack Attacks�Naturally! when they were just 16. Since then, they have written six best-selling�health books. They lecture on living a healthy life, clean eating, and having more energy at hospitals, schools, and health and wellness programs nationwide. They are favorite guests on many local and national television shows, including The Today Show and Home & Family. Judi and Shari are both married and have five children between them. They�reside�in Santa Barbara, California.